It occurred to me that I had this pair for a little while now but I never shared any pictures of them. 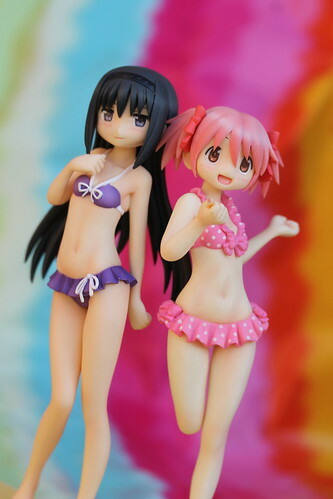 Madoka and Homura are from the series Puella Magi Madoka Magica, the figures are part of the Beach Queen line by Wave. The figures are approximately 1/10 scale and have a msrp of ¥3800 each. 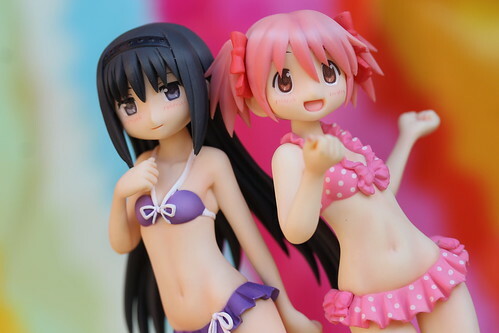 This post serves a dual purpose, I wanted to post about my somewhat newly acquired Homura and Madoka beach queen figures and I wanted to put up a little blurb about how I will be on vacation next week! What better way to say I am going on vacation than a couple of cute girls in bikinis, eh? I’m off to Disney World next week, I’ll have my laptop with me but chances are it’ll be radio silence from me next week. It’s entirely possibly that I’ll start catching up on my backlogged posts (more Madoka figures/new pullips announced/Sentimental Noon review) tomorrow. I’ll be stuck home all day obsessing like a drug fiend, frantically checking and rechecking tracking numbers to see if my Pukifee Vanilla and/or Dollfie Dream Sister Mayu will arrive before I leave for Disney instead of being held in postal limbo until my return…. so I may as well get something done, right? I think it is impossible for me not to smile whenever I see Madoka’s smiling face. I love how nicely Wave captured the art style of the series, I especially love the detailing on the eyes. There are actually figures of all five of the Puella Magi in this line, unfortunately though she is my favorite character I really find myself disliking the Mami figure from this set. Mami’s pose just seems really odd to me, so even though I love Mami I chose to skip this particular figure release of her. I quite like Sayaka and Kyouko‘s figures but will most likely skip them as I feel it would be odd to have everyone but my favorite character so far now I am quite happy with the pair Madoka & Homura. 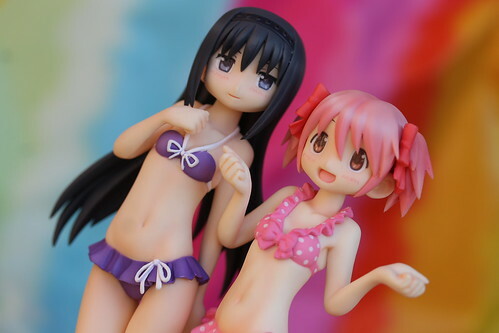 Homura tends to be my least favorite of the Puella Magi but I really like this figure of her and feel she pairs nicely with the Madoka figure. 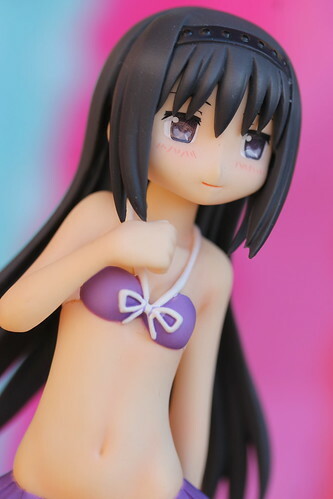 The paint is kind of messy in a few spots on the bikini around the tie/strap area, it’s really not too noticeable on the figure itself my macro lens just sees all. 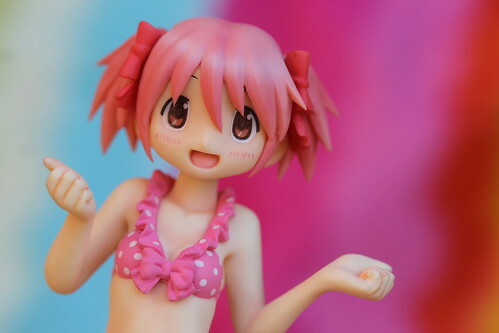 In other exciting Madoka news, after seeing the Good Smile Company Ultimate Madoka figure in the dealer’s room at Anime Boston I had the realization that perhaps I would not be satisfied with just having the petit nendoroid, figma and nendoroid of Madoka in her Ultimate form. 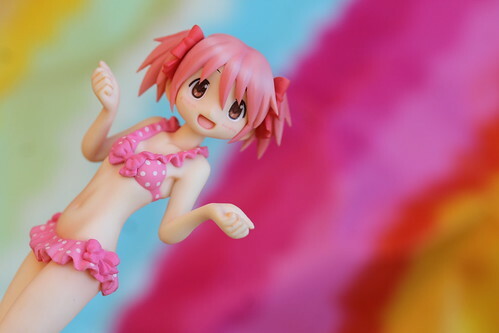 Ultimate Madoka should be waiting for me at the post office when I return from Disney, if I am truly lucky the Madoka school uniform version nendoroid will also be waiting for me upon my return (if the post monster hasn’t eaten her). 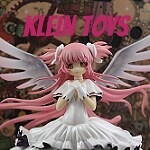 This entry was posted in anime figure, kleintoys and tagged akemi homura, anime figure, beach queen, homura, madoka, madoka kaname, Puella Magi Madoka Magica, wave. Bookmark the permalink.